Pesticide Free Cannabis Resin - Good for smoking, topical and oral/edible needs. This oil is made from Halley’s Comet flowers grown on Vancouver Island, in beautiful British Columbia! Halley’s Comet is a Sativa dominant hybrid named after the brightest comet in the sky. The high is very functional and uplifting with gentle analgesic effect and is good for day and evening medicinal and recreational use. It induces clear headed cerebral euphoria, very functional high that prompts laughter and socialization, uplifts mood and increases creativity. Stimulates appetite, relaxes the body with a mild analgesic effect. This high-end RSO has been independently tested at MB labs to contain over 25.4% CBD and 10.2% THC! 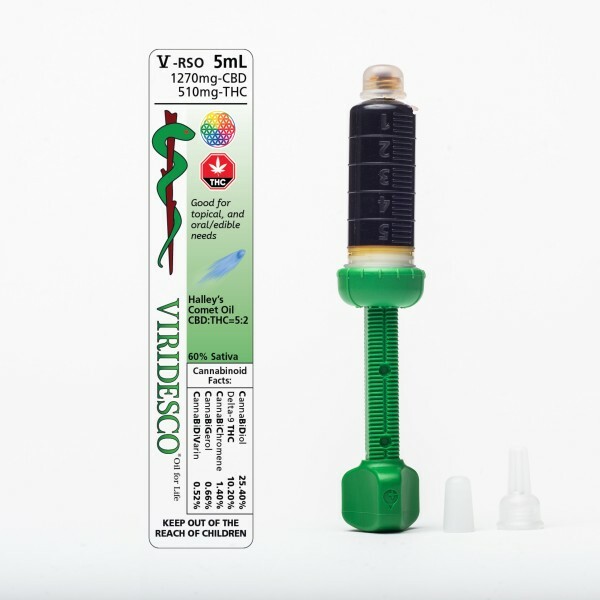 VIRIDESCO OIL (Phoenix Tears Oil) is a potent concentrate formulated from the drawn-out cannabinoids of the cannabis plant through an extraction method, achieved through the skillful purging of the solvent used and cannabis solution. The oil comes packaged and ready for easy-use dosage in The Patron Eos-Dispenser. This dispenser is the world’s first dispenser specifically designed for the viscous resins of Hemp! Accurate to 0.01ml, Patron’s industry-defining Patron Dispenser is the most precise on the market, down to the smallest millilitre. Viridesco Oil - Halley's Comet - 5ml - 60% Sativa 5ml dispenser 1270mg CBD/510mg THC (60% Sativa) CBD:THC=5:2 (25.40% CBD/10.20% THC) Pesticide Free Cannabis Resin - Good for smoking, topical and oral/edible needs. CannaBiDol 25.40% Delta-9 THC 10.20% CannaBiChromene 1.40% CannaBiGerol 0.66% CannaBiDiVarin 0.52% This oil is made from Halley’s Comet flowers grown on Vancouver Island, in beautiful British Columbia! Halley’s Comet is a Sativa dominant hybrid named after the brightest comet in the sky. The high is very functional and uplifting with gentle analgesic effect and is good for day and evening medicinal and recreational use. It induces clear headed cerebral euphoria, very functional high that prompts laughter and socialization, uplifts mood and increases creativity. Stimulates appetite, relaxes the body with a mild analgesic effect. This high-end RSO has been independently tested at MB labs to contain over 25.4% CBD and 10.2% THC! This product is 60% Sativa from this resource: https://cannasos.com/strains/hybrid/haleys-comet https://youtu.be/dHf8J0AaRzg VIRIDESCO OIL (Phoenix Tears Oil) is a potent concentrate formulated from the drawn-out cannabinoids of the cannabis plant through an extraction method, achieved through the skillful purging of the solvent used and cannabis solution. The oil comes packaged and ready for easy-use dosage in The Patron Eos-Dispenser. This dispenser is the world’s first dispenser specifically designed for the viscous resins of Hemp! Accurate to 0.01ml, Patron’s industry-defining Patron Dispenser is the most precise on the market, down to the smallest millilitre.